The English Electric Canberra being developed way back in the nineteen forties flew first in 1949 and was developed into many variants. 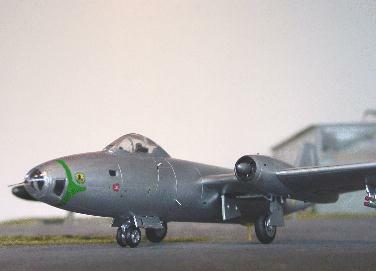 Various kits have been released, and especially in 1/72 scale, many kits and re-issues appeared. This page shows a number of models made. The kit is basically good, but the wingtip tanks seem to be inaccurate (too large). 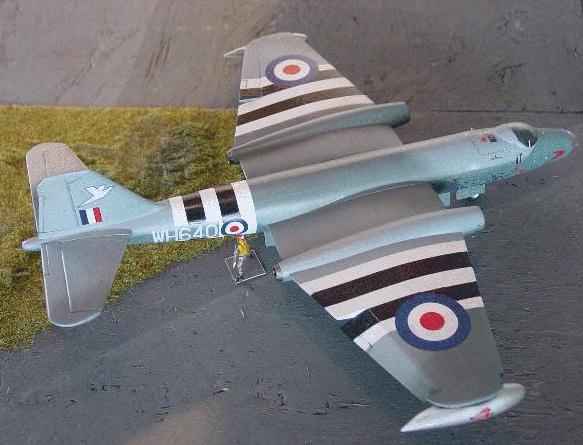 The model as made here has a PRU blue and grey scheme with back&white Suez campaign stripe markings. 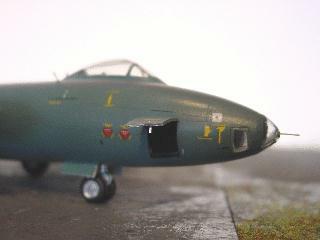 The model was further detailed with the bomb bay as supplied with the kit and by adding a small window below left of the cockpit. The decals came from Modeldecal. 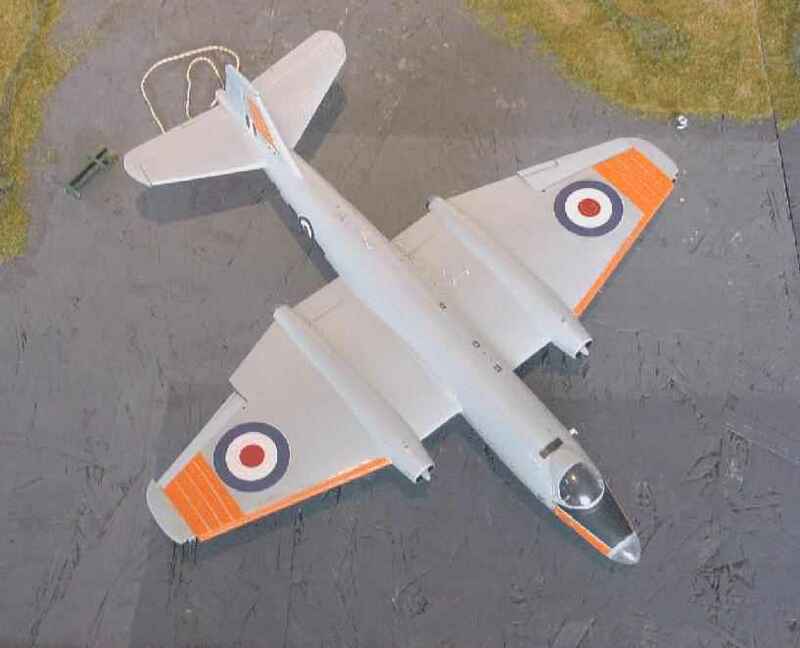 Another Airfix kit was made to represent a RAF Canberra with dayglow markings. This model was further detailed by especially paying attention the dayglow painting. All Airfix and other Canberra kits had their panellines sanded off and re-scribed in the models using an Olfa P-cutter. Balancing the model is quite difficult, so I added various sorts of "pogo sticks".... crew, probes, etc ..
Airfix model (2) Note dayglow Leading Edges ! The old FROG kit no. F203 of the Canberra represents a Canberra type B.I.12 with the offset cockpit. The model is not so bad, and by refining it, it can be build into a nice model. All panellines were sanded off and rescribed. The wheel bays were added with boxing in through thin plastic cart. 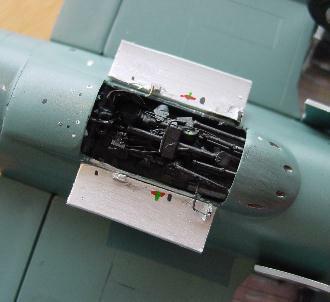 ...and adding details such as the exhaust and openings on the front ends of the nacelles. Also the crew entry hatch was opened. 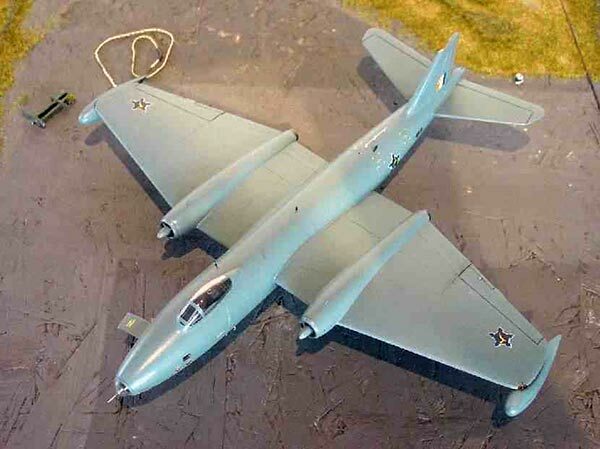 A model representing a South African AF B.I.12 was made with an overall colour finish of matt PRU Blue. 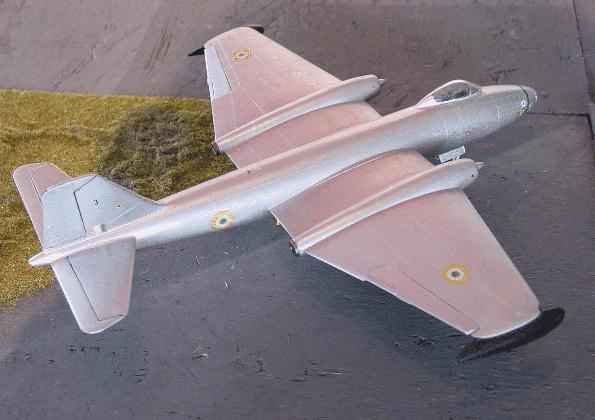 Another Frog kit was finished representing an Indian AF aircraft with a metal overall finish. 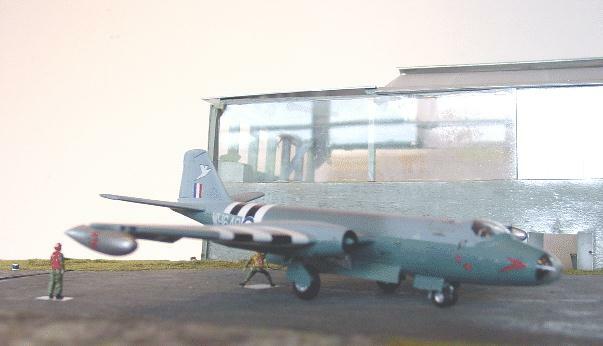 The unit's markings were hand painted, except for the roundels. This kit was also released first by NOVO of the USSR and later on by Revell kit no 0389 of Germany.